In the work that I’ve done across the past 35 years connected to peer coaching, instructional coaching, mentoring, and coaching connected to supervision, one of the elements that has been present from the very beginning is the realization that coaching creates discomfort. Being coached brings some level of discomfort. To grow from the coaching experience, a person must become comfortable with having those feelings of discomfort. I often introduce this idea using Tom Gordon’s Skill Development Ladder where he describes four steps as unconsciously unskilled, consciously unskilled, consciously skilled, and then unconsciously skilled as the top step. Progress is made as a person moves between the steps on the ladder. At the bottom of that ladder unconsciously unskilled means, “I don’t know that I don’t know.” It feels fine. Often, when I’m working with first-year teachers getting ready for that first day on their new job, I share with them that when they introduce themselves to other teachers on staff and they explain that they’re a new teacher, they might see the experienced teacher giggle just a little bit. I point out that they aren’t laughing at the new teacher, they’re remembering. Everyone knows that a new teacher’s career is likely to advance an entire level somewhere opening day. You’re going to become conscious of what it is that you don’t know. You don’t have to be new to have that experience; all you have to do is change. I started my teaching career in grades five and six for five years and then transferred to teach first grade. That first day in first grade when I wrote my name on the board and a student laughed and said it was a funny picture, I realized what I didn’t know about the job that I was taking on. There’s certainly great discomfort that comes from recognizing what I don’t know. Only by accepting that discomfort is a person ready to grow. When I’m at that second step on the ladder, I’m conscious of the fact I don’t know something, and I want to move to the next level of the ladder to becoming consciously skilled. When you’re consciously skilled, you can implement something new or different but only if you do it consciously. When I’m doing it consciously, it means all my attention is focused on it, so it’s choppy. It doesn’t flow: it’s not natural. That produces discomfort. 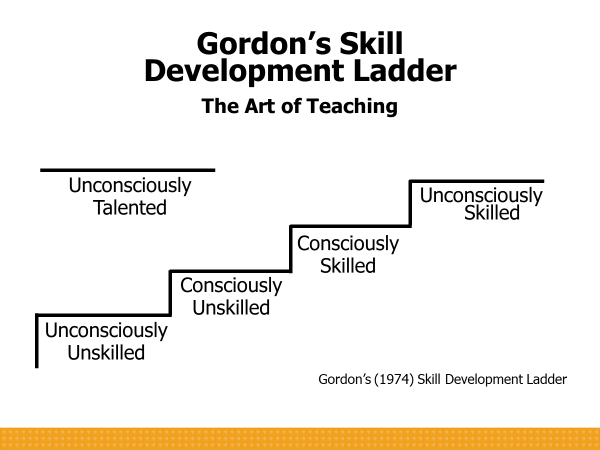 If I’ve practiced something long enough, I move to the top level of Gordon’s ladder and I now become unconsciously skilled. Some people are surprised, as It looks like Gordon’s suggesting the highest level as unconscious, wouldn’t it be better to be conscious than unconscious? No. I do my best teaching when I do it unconsciously, with automaticity. What athletes call in the zone. I’ve added another spot to Gordon’s work that I’ve called unconsciously talented. Teachers here perform with the automaticity of the unconsciously skilled individual but are unable to identify consciously what they have done. Like a top professional athlete who isn’t successful as a coach, the unconsciously talented teacher has trouble mentoring another because so much of their success is based upon unconscious behaviors. 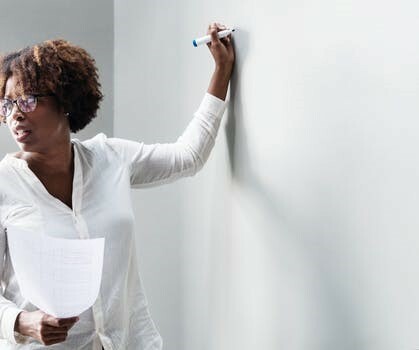 Unconsciously skilled teachers can reflect and understand why a successful learning experience was successful or when things aren’t working can come back to a conscious level and identify what they could change. Whenever I’m working at that conscious level, I’m going to feel a degree of discomfort. If I don’t take on that discomfort, I can’t put myself into a growth situation. When working as a mentor, peer coach or instructional coach, I need to know that my presence will be bringing some discomfort to the person that I’m coaching. As a person being coached, I need to recognize that unless I can get myself to enter that area of discomfort, the growth won’t occur. As leaders, our goal is to create an environment where people will feel comfortable with that discomfort. I find it intriguing that teachers recognize this with their students. They work to create a classroom environment where students can be comfortable with discomfort. Yet, they frequently work to avoid discomfort for themselves. Many teachers will step back and not have the door open for other teachers to come in, not approach colleagues for peer coaching or approach the instructional coach for coaching because they want to avoid that feeling of discomfort. Leaders can build trust by openly sharing their discomfort. Sharing with people how clumsy it feels to be using that new technology resource or being observed by a coach during a staff presentation. Yet, I’m doing it because our students are too important for me not to. Our students deserve my willingness to go through that uncomfortable phase. Much the way teachers create classroom environments where the students support each other, we need to create a school culture where teachers support each other. A place to be comfortable with the discomfort of being learners. As I work with mentors, this concept is huge. Comfort with discomfort. . . . Anytime we find ourselves in a newcor different situation, being OK with this feeling is important! Until I can be uncomfortable working to learn, I am comfortable with the status quo!